Hawick play their game in hand on Saturday, playing host to Glasgow Hawks at Mansfield Park. And, as any Teri will tell you, this game is massive. A bonus-point win will take them to within four points of fourth-placed Gala with only two games to go. The Maroons, who are in the better position to claim a play-off place, have arguably a more difficult run-in than the Greens, and the Netherdale men’s form has been patchy of late, so it’s not outwith the realms of possiblility that they could be caught. But first, Hawick must get past seventh-placed Hawks, who are not completely out of the running for the play-offs themselves. 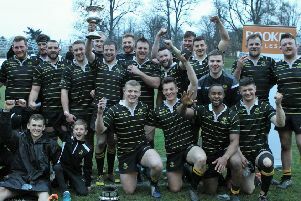 Also in the Premiership, Melrose are on the road to Currie. In National Division One, Peebles travel to Dundee, whicle Jed-Forest and Kelso are both at home, to Marr and Aberdeen Grammar respectively. Selkirk, who were understandably angry after last week’s game against Aberdeen was not postponed until they had travelled up as far as Dundee, face GHA at home. See page 72 for all fixures, but also check before heading out to see if games are on.